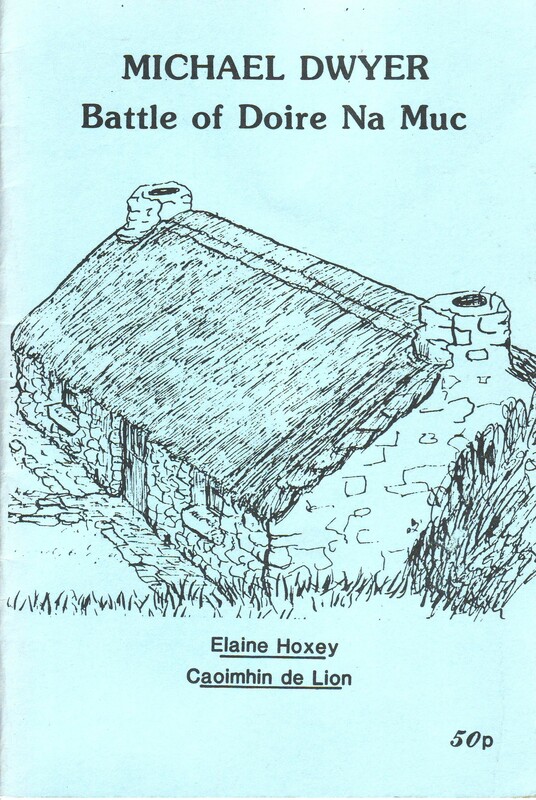 About: This booklet mainly consists of a reprint of a chapter on Michael Dwyer which was published in the book: ‘The Croghan Valley’ in the late 1960’s. Included within the main piece is a short account of the battle of Doire na Muc (Derrynamuck) when Dwyer made his escape from the Crown Forces. It is likely that this booklet was sold as a souvenir to visitors to the Dwyer McAllister Cottage in Derrynamuck, Knockanarrigan, Co. Wicklow. Contents: Preface / Graeme Cooke — Michael Dwyer (from ‘The Croghan Valley’ by Caoimhín de Líon, by kind permission of Kamac Publications) — Doire na Muc – Michael Dwyer escapes capture at Doire na Muc [artist’s impression]. Extra #1: Includes 2 maps and some other illustrations.